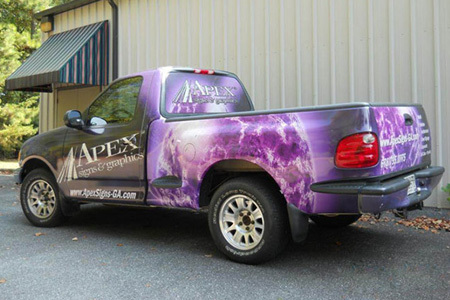 Apex Signs & Graphics is a custom commercial sign company focused on helping clients to meet their marketing goals. Whether working on the exterior sign of a retail location, the graphics for a trade show exhibit, or the graphics for a vehicle fleet, our company focuses on developing products that help you to meet those goals and to improve the visibility of your business. Founded in 2004, our staff brings 35 years of combined expertise in graphic design and signage project managment to each of our clients. We provide design, fabricaton and installation. The end product , whether it is large or small, delivers YOUR message and helps to create top-of-mind awareness that leads new customers to do buisness with your company and brings satisfied customers back to become REPEAT customers. Whether you bring us doodles on a napkin, or camera-ready art, we can turn them into effective, commercial signage design. The experience and crativity of our staff focus on legibility, readability and visibility to get you maximum NOTICE-ABILITY. The end result is a MESSAGE that brings you more business and makes you more money. There are numerous ways to produce commercial signage. The wide array of materials and methods available today allows us to customize commercial signage to match the planned location, the budget and time frame needed. This is the “wild card” element of many projects. We can manage this process and/or provide guidance for you to navigate through it. We have worked with most municipalities in metro Atlanta, including the counties of Fulton, Gwinnett, Forsyth, Cherokee, Cobb & Dekalb. We also have experience in cities of Atlanta, Alpharetta, Johns Creek, Milton, Roswell & Sandy Springs. It is not enough to simply design and build a sign. That sign has to be installed and funtional to produce the planned results. Our installers are chosen for their experience and attention to detail in getting this part of the job done properly the first time.